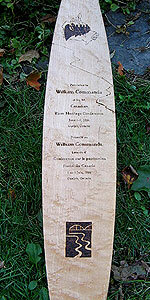 This paddle was presented to Max Finkelstein, recipient of the 2009 Bill Mason Award at the Canadian Heritage Rivers Conference. A blank paddle is intimidating and this one for Max left me blank as a doorknob! After a few months and many (!) false starts....I decided to just draw right on the paddle to see what would come. To trust my hand and intuition. The song 'Blackbird' kept running through my mind, as did legends, stories and memories of raven the trickster, the ingenious crow, the dove bringing an olive branch to Noah, how the loon got its necklace, the dove of peace, nightingales and whippoorwills singing us to sleep, the grace of herons in flight, hawks soaring, and ....oh yes..... geese flying north in incredible migrations at night! This bird arrived on the paddle, flying north in the moonlight. Like any migration, it is flying towards hope. The stone is one I picked up, as one does, on a canoe trip....a totem of memories and beauty and gratitude and hope. A paddle for Jacintha and Fred in the YK. Wishing them a wonderful life together. 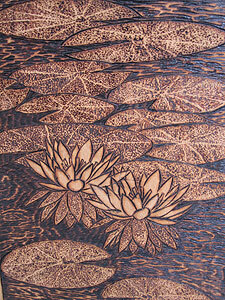 Waterlilies are food for the soul! Perfect, white, wax-like, quietly floating on dark water. A happy anniversary to Sue and David!!! Those fortunate to paddle a northern river are touched by the grandeur of the mountains, forests and glacial fed waterways. Hikes provide memorable vistas with canoes and camp sites minuscule in the distance like this view inspired by a scene reminiscent of the beautiful Athabasca River! 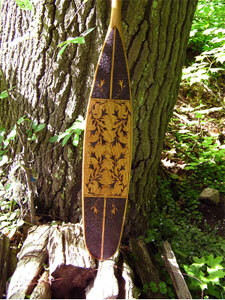 This is an engagement paddle (instead of a ring). What a wonderful idea! I am a child of the Canadian Shield, with memories steeped in images of rocks and pine trees along the waters edge. This is 'home' to me. ahead? That's where we're going." The stuff of life…. and canoe trips. 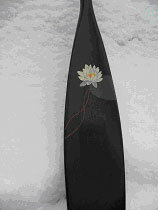 Commissioned in 2001 for the prestigious Bill Mason Award, this paddle was presented posthumously to Pierre Elliot Trudeau, former Prime Minister of Canada. Scenes from the fabled Nahanni River flow along the paddle shaft and blade. The Nahanni, a designated World Heritage Site, and Canadian Heritage River, was a favourite of both Mason and Trudeau. 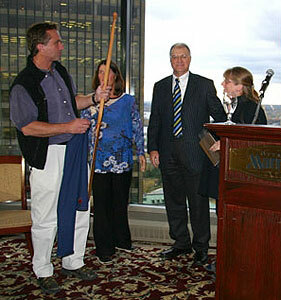 2007 Heritage Rivers Conference, Bill Mason Award presented to Hap Wilson. It was quite daunting to do a design for Hap – a formidable artist. So, I wanted to do a design that was very different from his beautiful realistic renditions of nature along canoe routes. This design was inspired by stunning traditional aboriginal bead and porcupine quill work. I so admire the flowing lines of flowers and the symmetry. petroglyphs and pictographs of canoes and animals honouring the great heritage of rock artists through the millenium and Grandfather's dream of rivers flowing free to the sea again. Whats a canoe trip without dragonflies! 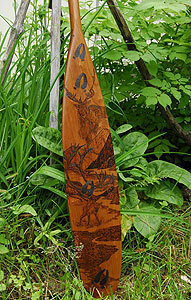 This paddle design celebrates his memories of being in the midst of a caribou migration up north with thousands of caribou passing him. It must have been amazing! The Great Blue Heron is so often seen from the vantage point of a canoe. It is a favourite bird of many who travel slowly along rivers edges. Someone says "shhhhh….a heron." Paddles stop. Bodies quiet. Eyes intent. In momentum, the canoe inevitably gets too close and this elegant creature stretches neck and wings and swoops away around the bend. Commissioned by a canoeist from Toronto, this design was a concept that appeared in daydreams and sketches. 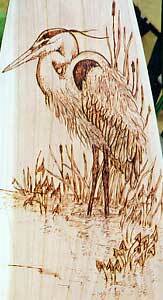 For the most part, I prefer wood burning however, this flamboyant design demanded colour! Maple leaves...glowing in autumn. All kinds of colours. 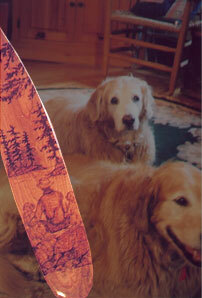 This paddle is from a memory of being surrounded by blazing red and orange leaves, floating down the air currents. A close-knit group in Manitoba requested a special 'goodbye and thank you" paddle for a fellow staff member who was moving on to the next phase in her career. A pine tree graced one side and their logo, the other. Inspirational poetry reflected the positive and thoughtful character of the paddle recipient. To honour her beadwork and aboriginal designs – this design is inspired by a Naskapi painted coat (Northern Quebec) . This paddle was made for my friend Ken in Winnipeg who loves blue flags (wild iris). 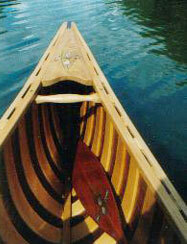 Ken spent 7 years building his beautiful cedar and canvas canoe! 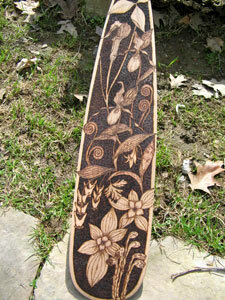 I was delighted to paint an iris on the deck to match the paddle…or does the paddle match the deck? My friend Ken built a special canoe for the love of his life. Beautiful canoe…..nice job Ken! 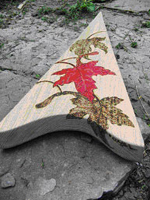 His request – maple leaves on the deck to match the maple leaves on the paddle. My friend Jay Morrison paddled Alexander MacKenzie’s route - paddling across Canada. He built his own boat. 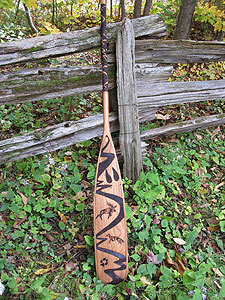 Named Daki Menan (meaning ‘Our Land’), this canoe is one tough boat!!! Jay requested a design with specific animals to have their spirits accompany him on his voyage. Here’s his canoe, pre-trip, on his living room floor. It is fun when requests come with very convoluted requests! 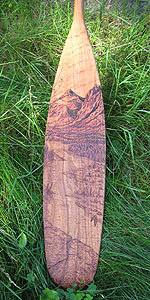 In this case – this paddle is for a chap in Ireland who is dreaming of canoeing in Canada. Hence…the dream catcher and various animals that can be seen on a canoe trip here. I was given a long list of animals to include in the design! The moment, like Michael, had magic in it. This design is a memory of beautiful Eustache Lake in Algonquin Park. You can only get there by a very long portage. I visited this lovely lake in winter. There are soaring pink granite cliffs with pines trees and cedars clinging to the precipices, leaning out into space. A beautiful place - worth the effort to visit. 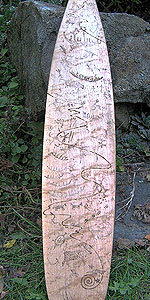 This paddle was a retirement gift for Charles, a biologist who worked for the Canadian Wildlife Service for many years. His colleagues wanted to represent his long and prolific career. The design was to show species he had studied as well as his contributions to numerous projects, committees and publications. Along with a very tight deadline, they supplied me with pictures, logo's, manuscripts, books, web sites and a postage stamp - all fruits of his labour. This was a lot of fun to work on and Charles was delighted! 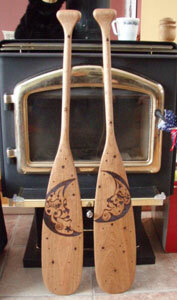 These paddles were made especially for my partner's grandchildren – obviously they are budding canoeists. My friend Edwidge works for Archives of Canada. She made great use of her workplace to research ideas for her own special paddle! Many books and discussions later - we developed this concept based on a design from Indonesia. Kendra L. loves celtic designs. I designed a never-ending knot and put a compass rose in the middle. The result is a very elegant paddle. The design shows up beautifully on the cherry wood. 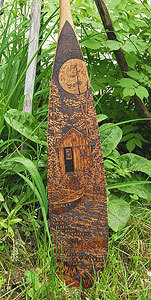 Marianne's father commissioned this paddle in honour of her graduation. In reviewing my reference books she found that pictographs and petroglyphs from the southwest 'spoke' to her. 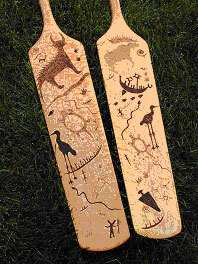 Marianne did some initial sketches and the design evolved to represent her upcoming canoe journey across Canada. The design winds around the shaft and blade to provide visual surprises as the paddle is turned. The spirals are said to mean 'migration'. The other 'glyphs' are animals, tracks, personal qualities, weather, phases of the moon, camp fire circles, etc - reminiscent of events on a canoe voyage. A family who have canoed and camped near amazing petroglyph sites in Ontario, chose these gorgeous memories as the theme for a wedding present. Yup – the paddles are for using….. even (especially?) when the snow is falling! 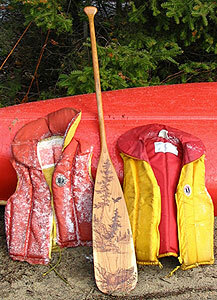 Paddle recipient, Elliot and his wife love paddling from ice out to ice 'in'. 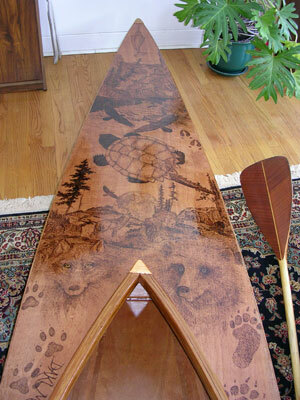 Doug B of Ottawa brought me a 20 foot kayak deck to embellish with creatures from the sea. This was fun - a pyrographer's dream canvas! Narwhales, whales, walrus, seals, belugas and porpoises swim from bow to stern. Thanks to my biologist friends for the loan of reference books on these wonderful animals. Doug has recently launched his beautiful craft. Cool! I provided a paddle for Canadian River Keeper Conference – presented to special guest, canoeist and environmentalist - Bobby Kennedy Junior. The other request was for simplicity and strength of lines. A retirement gift for a director of Parks Canada, to celebrate many years of service! This design is inspired by a paddle housed in the McCord Museum in Montreal (Passamaquoddy design circa 1850 ). Sometimes, designs just beg to be painted. I adore water lilies…. beautiful waxy white on tea-black water with red stems twirling downwards. A 50th birthday present for a botanist!